For example, in mid-October we had in our meeting rooms Andrew Kibblewhite and Paul James. Andrew is in charge of the Department of the Prime Minister and Cabinet. Paul was the head of the Ministry of Culture and Heritage and now he’s leading the Department of Internal Affairs. In a meeting chaired by Catherine Williams, they were talking to a group of other senior public servants about the theme of listening to people through open government partnerships. Open government is about opening up decision-making through the policy cycle to enable all interested members of the public to participate. From the perspective of our Office, it was great to see this much interest being paid to matters that are at the heart of what we do. Openness and engagement are critical to people’s trust and confidence in the public sector, and we’re deeply interested in the public sector keeping that trust and confidence. Some great connections were being made. 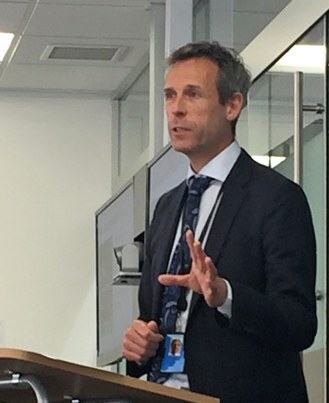 Andrew spoke about some of the work that the Department of the Prime Minister and Cabinet is doing – as part of its policy project - to strengthen public servants’ skills to support this push for listening and being open. Andrew drew attention to the IAP2 Public Participation Spectrum, and mentioned recent examples of policy processes where some of those different approaches (from informing to consulting, involving, collaborating, and finally empowering) had been used. Speakers noted that in the public sector, agencies often have to “buy in” the skills to run consultation exercises – to reach the people they need to hear from, ask the right and most useful questions, sift and sort the responses … Andrew seems quietly determined to lift the public sector’s ability to engage effectively with people without needing to buy in those skills. In my view, effective engagement with New Zealanders is essential. Research shows that good engagement with the people who will be affected by policy decisions results in more accessible, cost-effective, and efficient public services. It also helps to build a stronger civil society and improve the trust and confidence in our public sector that’s so important. New Zealanders are increasingly expecting to be involved and to have a say in how the services that their taxes pay for are designed and how they operate. Which is, obviously, fair enough. As Andrew noted, the trick is in making the right decisions about when to just do it and let people know, when to ask people what their views are, and when to ask people to help you design services. Being open about policy decisions is one thing – making those decisions in partnership is another level altogether. Paul started by reflecting on his new role at Internal Affairs, noting the change from Culture and Heritage isn’t such a big leap – both involve being a custodian of our nation’s precious taonga. Our iconic constitutional documents (like Te Tiriti o Waitangi and the Women’s Suffrage Petition) reflect our national heritage and connect us to times in our history that shape us as a nation. Not only do those taonga need to be cared for and protected for the benefit of future generations, they also need to be as open and available to New Zealanders as they can safely be. the Government Chief Privacy Officer’s efforts to lead an all-of-government approach to privacy. These are all matters important to us – the Office covered them in our series of articles about data and in our report reflecting on the work that was part of our recent Information theme. We talk a lot about how leaders set “the tone at the top”, and that tone affects the whole culture of an organisation – how its staff work, how they view each other, how they view the people they serve. It was encouraging to hear Paul talk about the emphasis on listening that is core to the Department of Internal Affairs. It’s something staff are expected to demonstrate internally and in their work with New Zealanders; being open to hearing what would work and what could work better. Paul conveyed a genuine commitment to being inclusive, listening to what New Zealanders tell his Department, and designing better services that put people first. I left the Forum feeling quietly optimistic that senior leaders are working hard to ensure that the public service is listening to and genuinely serving New Zealanders.